Should we call this a pie, a tart, or a custard? It has elements of all three. 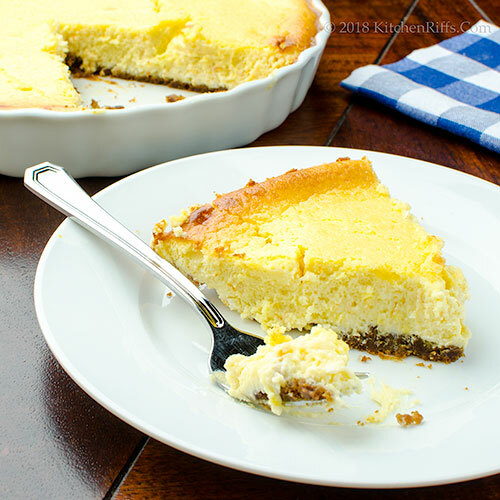 Ricotta pie is an Italian favorite, especially at Easter time. 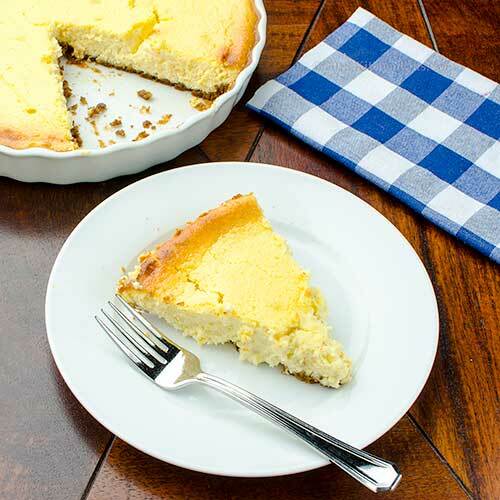 With the addition of cream cheese, it becomes something halfway between pie and cheesecake. So we guess you could call this cheesecake, too. This recipe isn’t as sweet as most cheesecakes, but it’s plenty satisfying. You can make this dish in a traditional pie plate or in individual ramekins without a crust. We like it both ways, but we think it’s actually better without the crust (which makes it more like a custard, but whatever). So, although the recipe includes a crust, feel free to omit it. We think a ginger-snap crust works particularly well, but you could substitute regular pie dough or a graham-cracker crust if you prefer. Or see Notes for ideas on making a gluten-free crust. Mrs. Kitchen Riffs is the dessert maven in our household, and this is her creation. It’s adapted (loosely) from a King Arthur Flour recipe. Prep time for this dish is about 20 minutes. Baking time adds 45 to 50 minutes. Allow the pie to cool for at least an hour, preferably two, before serving. Preheat the oven to 350 degrees F. Butter the baking dish(es): You can use a 9-inch pie plate or tart pan or a 9-inch square pan. Alternatively, you can use about six 4-inch diameter ramekins (see Notes). Make the crust: Place the ginger snaps and melted butter into the bowl of a mini food processor. Process until the mixture is the consistency of wet sand. Press the mixture around the bottom of the pie plate or baking pan (we usually don’t press it up the sides of the pie plate or pan). Set aside. Make the filling: In the bowl of a stand mixer, or in a large bowl if using a hand mixer, beat the cheeses and sugar until creamy. Beat in the eggs. Add the almond extract, vanilla extract, salt, and orange zest. Mix until well combined. Bake the pie for 45 to 50 minutes, until it is becoming brown around the edges and an instant-read thermometer inserted into the center shows about 160 degrees F. The pie will still be quite liquid in the center, but will set up as it cools. Do not overbake. Remove the pie from the oven and cool it on a wire rack. Serve at room temperature or refrigerate to chill. Instead of almond extract, you can try using ¼ cup Amaretto liqueur (the original recipe offers this as an option). If baking this dish in a pie/tart plate: The recipe probably works best when baked in a deep-dish pie plate or a 9-inch square pan. Don’t use a metal two-piece tart pan, though (one with sides that are easily removable, leaving you with a freestanding tart in a pastry shell). The ginger-snap crust isn’t sturdy enough to support the filling for this dish. Use a one-piece pan. If you use a standard 9-inch pie or tart plate, you’ll probably have some filling mixture left over. You can pour this mixture into oven-safe ramekins and bake them separately. 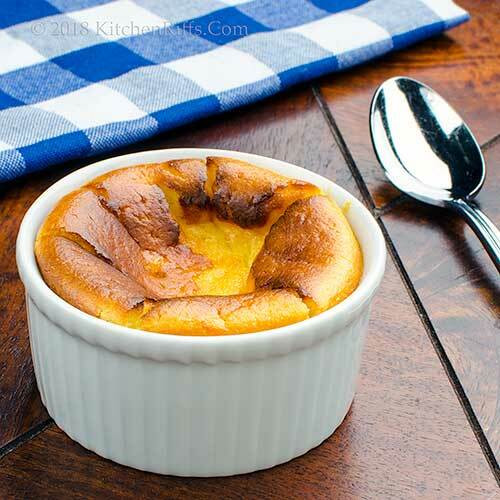 Or you can just bake this whole recipe in individual ramekins and serve it that way. We often do. It’s easy to make this recipe gluten free: Just skip the crust entirely. Or substitute nuts or gluten-free cookies for the crust. Speaking of the crust, you can make it thick or thin, depending on your preference. One cup of ginger snaps will make just enough to cover the bottom of a pie plate. Two cups will make enough to create a thicker crust, and may even leave some for pressing around the sides of the pie plate. Eggs carry a slight, but real, risk of salmonella. You can buy pasteurized eggs at most grocery stores, and that’s what we use when we bake. Why? Because we can’t resist tasting the batter – which has raw egg in it. We use kosher salt in cooking and baking. Because its flakes are larger, kosher salt doesn’t pack as tightly in a measure, making it less salty by volume than regular table salt. So if using regular table salt in this recipe, add just a couple of pinches. Or to taste (the recipe calls for so little salt that it doesn’t matter much). What’s the difference between a pie and a tart? Not a lot, actually. Both usually have crusts, but a tart traditionally is baked in a container that has fluted edges. The main difference: Tarts usually (but not always) are removed from the baking dish before being cut into serving slices – so you get to see the entire crust with its attractive fluted sides. The crust of course needs to be sturdy enough to support the baked filling when it’s removed from the dish. Pies usually are not removed from the baking dish before being cut and served. How about custard? Well, it usually doesn’t have a crust and often is baked in individual serving dishes. 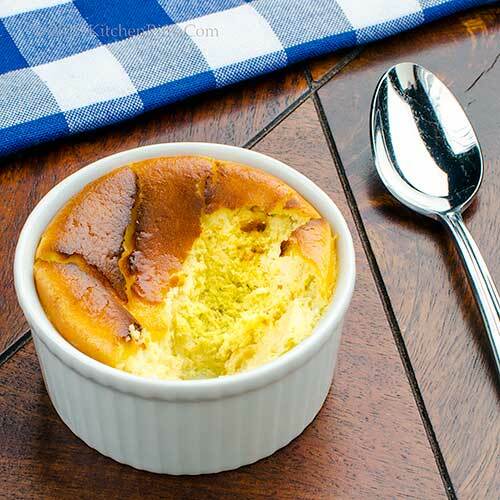 So if you make this recipe without a crust and bake it in individual ramekins, it resembles a custard. But custards typically contain milk or cream, which this recipe doesn’t have. So this dish probably most resembles a pie. That’s our story, and we’re sticking to it. That’s my Mrs K R – sweet as pie. YUMMY! I prefer desserts with less sugar, but still sweet enough. This is perfect with crust or without! Hi Angie, the crust on this is awesome -- wonderful flavor. Despite that, I think it's even better without the crust. You'll have to try it both ways to decide. :-) Thanks for the comment. Hi Madonna, it's a bit like that tart that you made not that long ago. Love this kind of dish, too! Thanks for the comment. Hi Kelsie, ginger snaps are so good! One of my favorite cookies when I was a kid. And this dessert is terrific. Thanks for the comment. Hi Pat, the ginger snap crust is wonderful! Thanks for the comment. Hi Mae, it is, it is! :-) Thanks for the comment. That looks so amazing! I love ricotta and it is so good in desserts. And the ginger snap crust is a GREAT choice! Happy Easter. Hi Evelyne, ricotta IS terrific in desserts, isn't it? Happy Easter, and thanks for the comment. I’ve made similar cakes and pie fillings, and they’re good, especially with freshly made ricotta, but I love the ginger snap crust! A dessert worthy of the splurge of the fancy "basket" ricotta! Holiday traditions are wonderful. Hi Mimi, that crust is really nice, and not as common as a graham cracker crust for a recipe like this. Thanks for the comment. Hi Tricia, yup, this has your name on it. :-) Happy Easter, and thanks for the comment. Hi Deb, it's definitely worth getting good ricotta for this! Thanks for the comment. Hi Greg, yup, this dish has snap. :-) Thanks for the ocmment. Hi Merryn, the combo of the ricotta and cream cheese is really nice. You'll like this. :-) Happy Easter, and thanks for the comment. I would like a slice, please. Need an Easter dessert and I like the versatility of this recipe! Thanks and happy holiday! Hi Debra, this has become one of our favorite desserts. Really good. i-) Happy Easter, and thanks for the comment. I don't care what you call it but it does sound great! I love the idea of making it in small ramekins. And I love cheesecake but usually it is too rich for me. This sounds ideal! Hi Abbe, cheesecake is rich, isn't it? Nice thing about the ramekins is you can pretty strictly control portion sizes. Unless one has two. :-) Thanks for the comment. Hi Sherry, yours sounds good! :-) Thanks for the comment. Hi Rosemary, I've never tried ricotta on toast, but it sounds wonderful! Maybe add a hit of cinnamon, too. :-) Thanks for the comment. Loving that crustless version and that delicious golden brown top. We love just delicately sweet desserts so this would be right up our alley. Winner of a recipe John. Wishing you and Ms. Riff a super weekend! Hi Bobbi, the crust is really good, but we much prefer the crustless version, too. You'll like this -- it definitely has some sweetness, but just a tinge. Just barely enough. :-) Thanks for the comment. I'm with you - this is delicious no matter what you call it! Love the contrast of the ginger crust. Love easy recipes, specially the portioned ones. I like the ramekins version. Thanks for the recipe and happy Easter. Hi Laura, this is impossibly good. :-) Thanks for the coment. Hi Amira, we like both versions, but make the ramekin version more often. :-) Thanks for the comment. Gorgeous dessert and I love the addition of the ricotta. Cheesecake tends to be a bit heavy, but I can see that this is much lighter. When you said that the crust could be eliminated, I thought that I would probably do that. However, when I saw that the crust was made with ginger snaps - no way!!! That sounds awesome! Thanks John! I love this! Hi MJ, pretty hard to resist ginger snaps, isn't it? :-) Thanks for the comment. I am imagining myself eating several slices of this pie topped with berries. Hi Denise, good call -- this is really good with berries. :-) Thanks for the comment. What a beautiful Easter dessert this would make. Love the tip on making it gluten free since I have a family member who can't have gluten! Hi Ashley, I think we all have family or friends who can't tolerate gluten, so when possible we like to give that option. :-) Thanks for the comment. I opened the post and Oh my! That looks delicious! I especially appreciate that it's not terribly sweet. One can always drizzle on a little honey or a spoon of fruit preserves. Hi Lydia, haven't tried this with honey, but fruit preserves are wonderful. :-) Thanks for the comment. Hi GiGi, so you're the one that did that! :D Thanks for the comment. Hi Carolyn, this is SO good -- and it IS perfect for Easter. :-) Thanks for the comment. John, I think I would eat all of this!! I wouldn't want to share :P Sounds perfectly delicious!! Hi Marcelle, I'm tempted to eat an entire batch of this, too! But it's way too rich -- one piece will do me. :-) Thanks for the comment. This looks delicious and a happy Easter to you . Hi Gerlilnde, it's really good. :-) Happy Easter, and thanks for the comment. Just the kind of pie I like- light and fluffy but beware- I could definitely eat this whole pie in one siting! Hi Fran, this is pretty rich, but I could probably eat the whole thing by myself, too. :-) Thanks for the comment. This is one of my favourite pies, the slught sweetness is just perfect for my taste. Next time, consider baking this pue in a bain-marie to avoid cracking. Allow it to cool in the oven over time if you can. Hi Eva, good idea about the bain-marie! We make a similar recipe that way -- should try it with this one. Thanks for the comment. Mmmmm yum! I love the idea that this pie is not overly sweet but just sweet enough. What a lovely dessert this will make. Hi Emma, this is a terrific dish -- our new favorite dessert. :-) Thanks for the comment. You're bringing back some childhood memories. My grandmother made a cheesecake very much like this one only without the crust. She called it "pizza dolce". Hi Marta, you'll love this -- SO flavorful! Thanks for the comment. Hi Frank, we go back and forth between liking this better with and without the crust. At the moment, crustless gets our vote. Although that ginger snap crust is pretty good! Thanks for the comment. Hi Raymund, you'll love this -- terrific flavor. :-) Thanks for the comment.